2017 Anthony Road Winery, Riesling, Semi-Dry, Fingers Lakes, New York State. 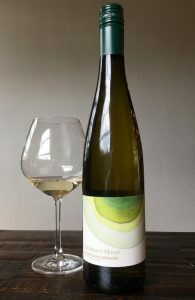 The lightly sweet Riesling, Semi-Dry, by Anthony Road is a nicely balanced and generous wine with terroir driven character, and it is very impressive for the price leading with the white flowers, peachy fruit and lightly smoky/flinty with a crunch of mineral tones. This vintage feels fresh on the light to medium palate with a nice zip to it and a lingering finish with the sugar given more of a sensation of texture instead of syrupy, with real racy and brisk acidity. A ripe selections of peach, apricot, green apple and citrus fruits stand out on the palate in this fun Finger Lakes Riesling, making it a wine to look for when you are in the region. Not much of this stuff gets out of the New York State market, so, it will be a hard get unless you go there, but it is good enough to make you think of a trip to this exciting area. The shale soils of Lake Seneca in New York’s Finger Lakes are the Riesling hot spot these days with some amazing examples finally getting the praise they they so deserve, and I was thrilled with a recent tasting of some of this regions examples, and in particular this new to me winery, Anthony Road that does a fine selection of dry and off dry styles. The owners, John and Ann Martini moved to this property back in 1973, which is a peaceful farm right on the shores overlooking Lake Seneca, and were talked into planting a vineyard and over the years it has grown to about 30 acres and after trying a few varietals it focused on Riesling. For many years Anthony Road were led in their winemaking by the German ex-pat Johannes Reinhardt, who eventually left to pursue his own wines, but before training his replacement, Peter Becraft, who is making the wines and running the cellar here to great effect, along with his assistant Lynne Fahey as well as Brien Gardner, who heads the vineyard management overseen by the Martini family. Anthony Road just got a huge boost when Riesling guru and head reviewer on all things Riesling for James Suckling, Stuart Pigott gave their last dry Riesling 95 Points, and serving notice this was a winery to watch, lucking for me I was able to get a bottle prior to Stuart’s rating of their wines. This 2017 Semi-Dry is more like a modern Feinherb, not quite as sweet and a Spatlese and richer in texture than a Kabinett, at about 17 grams of RS (sugar), but with about 9.36 of acid per litter this 12.5% Riesling is still vibrant, pretty zingy and with a serious palate impact, it’s all estate grown and pretty limited, with just over 500 cases made. Now while the Riesling is what the world is taking notice of, it isn’t all this winery does, in fact they make an array of wines from Gewürztraminer to Merlot, as well as a Rose of Cabernet and a Pinot Gris, all of which are very popular with the visitors to the area and the Anthony Road farm, but of which I haven’t tried yet. Anthony Road joins Hermann J. Wiemer, Ravines, Red Newt, Boundary Breaks and the Forge in getting serious attention for dry and off dry Riesling, so if you haven’t get into these wines yet, I highly recommend checking them out, these are wonderful terroir driven wines, many of which, like this Anthony Road are also killer values in mineral focused American Riesling.